Engine & Gearbox software transforms the way the BMW 335d drives, turning this humble diesel into a seriously fast road or track car whilst still maintaining great fuel economy. Our 335d engine software is available on our switchable remapping system ByteFLASH for delivery worldwide. The BMW 335d Engine is already a very good engine in factory form, however there is so much more potential to be released from the 335d through ECU remapping. The BMW 335d uses a Bosch EDC16 Engine ECU which is flash programmable via the OBD diagnostic socket in the passenger compartment. This means the ECU does not need to be removed from the car and the process can be completed either in-house or using our ByteFLASH handheld OBD programming solution anywhere in the world. We spent many months of development work on our BMW 335d ECU remap software. Careful changes are made to injection timing, duration, torque limiter maps plus turbo pressure and limiter maps to safely release gains of +74bhp and +130Nm of torque whilst also offering a smooth drive, much wider power band and improved throttle response. The 155mph factory speed limiter can also be removed from the engine ECU during a remap. 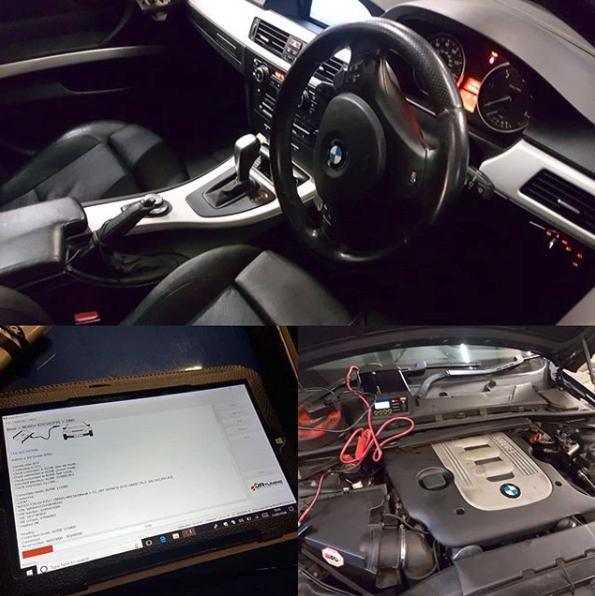 Too many times we've seen BMW 335d remaps which are sub-standard arrive at our premises with at best inferior power and at worst either too much turbo pressure or sky-high fuel rail pressure, both of which can cause expensive engine failures. All of our 335d remap software is safe for a standard car. We do not use any additional rail pressure and additional boost pressure is minimal at 10% above factory at peak, yet through careful modification of other parameters we still achieve one of the most economical and powerful 335d tuning files available. The BMW 335d Automatic Gearbox can also be improved by remapping the gearbox TCU. The gearbox TCU (transmission control unit) is essentially another ECU, very similar to the engine ECU but this one controls the automatic gearbox. The problem with only remapping the Engine ECU on the BMW 335d is the gearbox also has electronic torque limiters in place which prevent us from getting maximum performance and economy gains from engine tuning alone. Again, as with the engine, the gearbox TCU on the 335d is programmable via the OBD diagnostic socket, which makes this process nice and easy for the end user. Optimised shift points in ‘D’ mode. Optimised torque convertor lockup in all forward gears - to rid the vehicle of the vague/slushy behaviour exhibited stock. Raised torque limiters to allow for a stronger engine tune. Gear display in dashboard in all modes. Instead of D, DS or M1-6 the car displays D1-6, S1-6 and M1-6 in their respective modes. Rev-matched downshifts (throttle blip) in manual mode - the same as on the “M” cars. 25% faster gear shifts in D mode. 50% faster gear shifts in S and M mode. 50% paddle/tiptronic input reaction time. Full manual mode, no kick down or auto upshift in manual - true manual operation (can also support hardcut limiters). Earlier torque convertor locking provides a more 'connected' and less 'slushy' feel traditionally associated with automatic transmissions. It also provides efficiency improvements by transmitting a higher percentage of the engines power to the wheels earlier. This has the additional added benefit of hugely increasing off-the-line performance.